childrens-mouth-anatomy-thumbYour child’s 20 baby teeth will begin to appear usually between six and nine months, though in some cases it may start as early as three months or as late as twelve months. The two lower front teeth tend to erupt first, followed by the two upper ones. The first molars come in next, followed by the canines (eyeteeth). 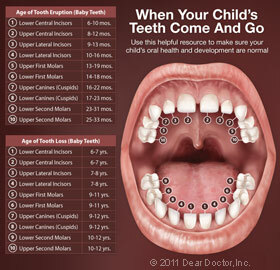 Sometimes your baby can experience teething discomfort during this process. If so, let us know and we will advise you as to the best course of action. Topical Fluoride — Fluoride incorporates into the enamel of teeth, making it harder and more resistant to decay. Although there is a small amount of fluoride in toothpastes and in some drinking water supplies, we can apply a higher concentration onto your child’s teeth for maximum protection. orthodontic-problems-thumbBy around age 7, most malocclusions have become evident. Interceptive orthodontic treatment around this time can help direct proper tooth positioning and/or jaw growth, eliminating or simplifying the need for later treatment. There are many orthodontic problems that can be detected early and are examples of why a trained professional should evaluate your child during his/her growth and development.